Dartmouth must consistently and vocally defend its values. On Saturday, March 24, thousands of people marched on Pennsylvania Avenue in Washington D.C. for the March for Our Lives, a demonstration in support of tighter gun control regulations. The march was accompanied by over 800 corresponding protests in cities around the world. Announced in the wake of the tragic mass shooting at Marjory Stoneman Douglas High School in Parkland, Florida, the march was the culmination of weeks of activism and outcries mostly by students and youth. That the speakers at the march were exclusively high school students or younger is emblematic of the youthfulness and longevity of the movement. Similar energy was also expressed on March 14, when tens of thousands of high school students protested by walking out of class in memory of the lives lost at Stoneman Douglas. Other spontaneous protests had previously occurred at high schools across the country, with various responses from high school administrators. While the Houston-area Needeville Independent School District threatened protesting students with three-day suspensions, the Arlington County School District outside of Washington D.C. issued a statement of compassion and support for its protesting students. It was under these turbulent circumstances that Dartmouth selected the Class of 2022. Many applicants to the College, torn between desiring to exercise their freedoms of speech and assembly yet fearful of retribution that might jeopardize their college admissions prospects, inquired with the College’s admissions office about the issue en masse. 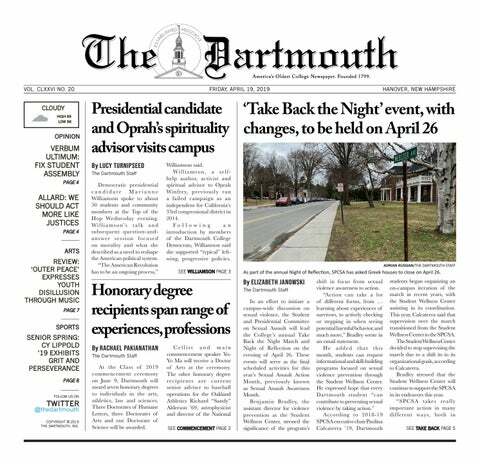 In response to questions from apprehensive high schoolers across the country, Lee Coffin, vice provost for enrollment and dean of admissions and financial aid, issued a statement clarifying that Dartmouth maintains its support for “active citizenship” and that “participation in peaceful protest in no way jeopardizes [one’s] admission to Dartmouth,” even if a student were to be disciplined or suspended. The Dartmouth administration should be applauded for its restated support of freedom of speech, protest and civil disobedience, values that are integral to the College. As one of the first universities in the country to issue such a statement, the undergraduate admissions office should also be lauded for setting a precedent for other institutions to follow. However, the decision by universities to reaffirm support of active citizenship has not come without scrutiny. Given the timing of the clarification, multiple national media publications, including Newsweek, Mother Jones and Forbes, surmised that the over 80 colleges and universities that issued statements were implicitly endorsing the aims of the movement: stricter gun control. Misperceptions are to be expected with any public endorsement from the College. Yet in this fraught cultural moment, it is necessary to scrutinize the motives and impact that a statement from one of the nation’s oldest universities could engender. This statement was needed, not only to support these particular protesting students but also because the rights of assembly and speech are seemingly under assault today, and from all sides. This will not be the last time in the near future that values dear to the College will be challenged. Dartmouth, as an institution and a community, must be ready to stand by those values whenever necessary. To that end, the College must be willing to issue statements of public support clarifying its values whenever those values are threatened, not only when it is politically expedient or when the zeitgeist appears to be in the College’s favor. The administration should be lauded in this moment for its affirmation of speech. But attacks on the rights of prospective students, let alone community-members, are not always so easily defended. Dartmouth should also not hesitate to vocally support the rights of free speech and assembly wherever they are threatened in the world. As a global institution, Dartmouth and its community members will inevitably be affected by threats to free association and speech anywhere, and it should explicitly maintain support for such basic rights in all contexts. It is especially important that the next time issues regarding freedom of speech, protest and civil disobedience arise at the College, the administration practices what it preaches. The College should furthermore take seriously the charge that its statement endorses the causes of the recent protest. Given the sheer volume of inquiries the College has received, it can only be assumed that Coffin’s statement of support was genuinely intended as a clarification to the College’s applicant pool. That said, the roster of admitted students likely also contains some who opposed the movement that has captured high schools across the country, and the College must ensure these students know their their viewpoints are respected as well. The only effective way to combat perceptions of bias in administrative support is a consistent, vocal and expressive affirmations of the College’s values. Prospective and current students spanning the political spectrum will likely appreciate a consistent defense of basic rights and freedoms. Any student who cannot agree with such a defense may not fare well against the diversity of ideas and divergent action that occurs on campus. Selective affirmation endangers and cheapens the values that the College holds dear. This Wednesday, 1,925 students across the nation and world were admitted to the Class of 2022. Among the ranks of students entering the Dartmouth community this fall will be many who marched for their lives, and many who might feel strongly about their rights to gun ownership, but all of whom exercised basic rights ensured by this nation and college. With such convictions among the community, Dartmouth cannot be timid in its affirmations.